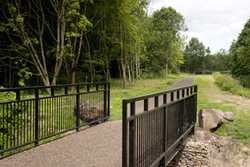 Port Salford Greenway is a 3 kilometre long cycling and walking route between Worsley Village and Peel Green. It is a mix of 3 metre wide traffic-free paths and quiet residential streets. The surface and gradients make the route suitable for all users including cyclists, pushchairs and wheelchair users. The first phase of the route was completed in June 2015, connecting Hallsworth Road and Blantyre Street. There are additional access points at Winton Park, New Lane, Stannard Road, Gorton Street and Brookhouse Avenue. Phase 2 was completed in June 2017 and extends the route to the Bridgewater Canal in Worsley which access points on Grosvenor Road and Hastings Road. Eventually it is intended that the route will directly connect to the AJ Bell Stadium and Port Salford as well as to existing employment opportunities in and around the Trafford Centre. This page will be updated if further funding is secured to extend the route. If you come across obstructions such as overhanging branches, brambles, or you spot any other danger, please let us know. TfGM have produced comprehensive cycle maps of the city, available on the TfGM website.